After showing off my sunny yellow Zara coat on Instagram twice now (exhibit A and exhibit B), I figured it was time it made an appearance on the blog! I never realized how much I love the color yellow until I bought this coat. I wear it all. the. time. It looks gorgeous dressed up or down and even though it’s in a bright hue, it’s a classic. It’s also perfect for this up-and-down weather we’ve been having – it’s still pretty chilly in the morning here but I am so sick of wearing black and all my heavy winter pieces! This coat was the answer to my prayers and it’s only $160. Another coat worth a gander is this pale blue one. Also $160. Does it get any better than that? This morning I’m jetting off to La Jolla for my friend Kat’s wedding! I’m looking forward to basking on the beach and then getting gussied up to celebrate. Hope you all have a wonderful, safe weekend! This coat is fantastic, great color on you. 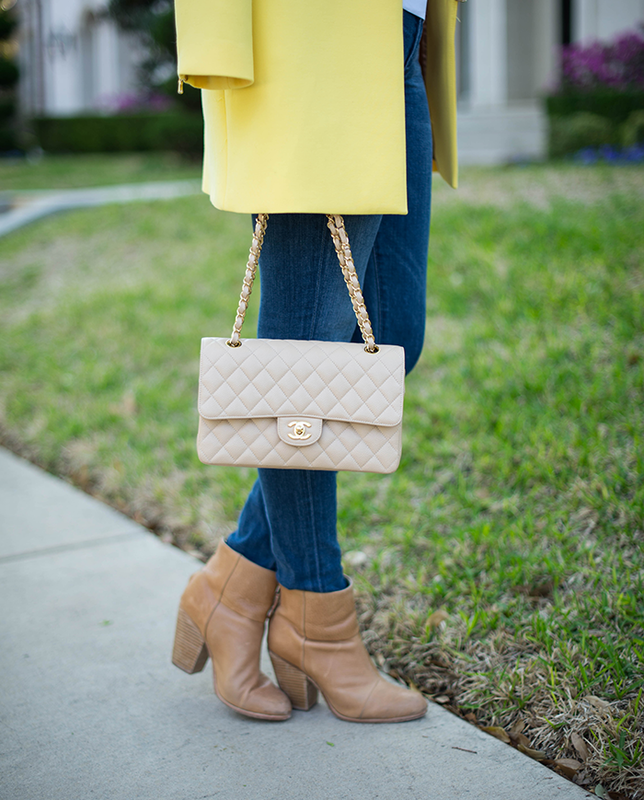 That pop of yellow is perfection! It makes the whole look! I keep seeing this coat on other people and now I think I need it – LOVE! Those sunnies are perfection! I’ve been wanting a thicker karen-walker-esque pair for ages! Have fun in La Jolla – such a pretty town! 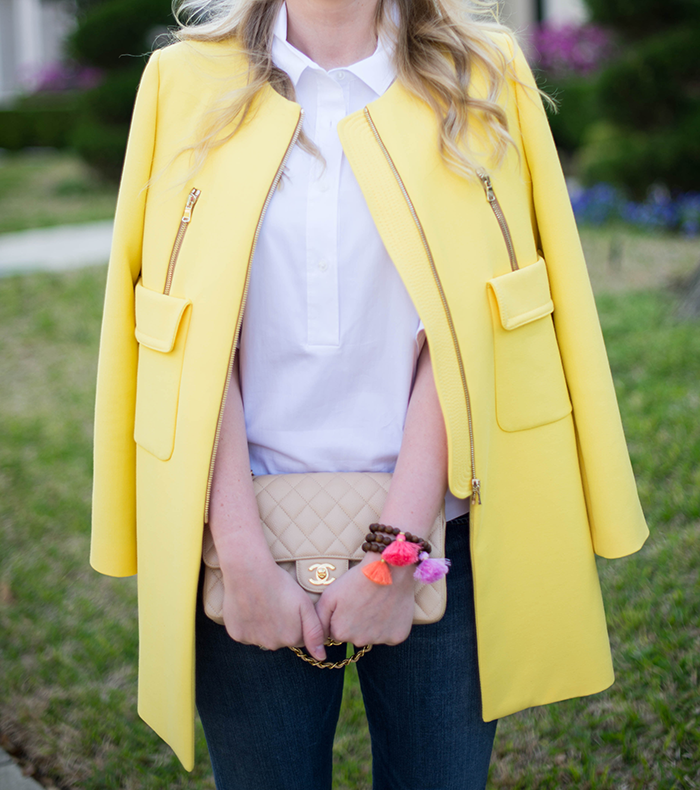 I’m really completely obsessed with that coat, it brings the perfect pop of cheer to chillier Spring days! Oh yes, I was hoping it would appear here, love this happy/sunny shade! There’s so much I love about this outfit… your sunglasses, bracelets and jacket, just to name a few! Have a great weekend! I love this coat!!! A great color on you plus I love the zipper details and the mod vibe. I like how you paired it down with denim and booties. Perfection! Holy gorgeous! I’m not usually a fan of yellow, but love this shade. Have a fabulous time in Cali! That coat is amazing!! 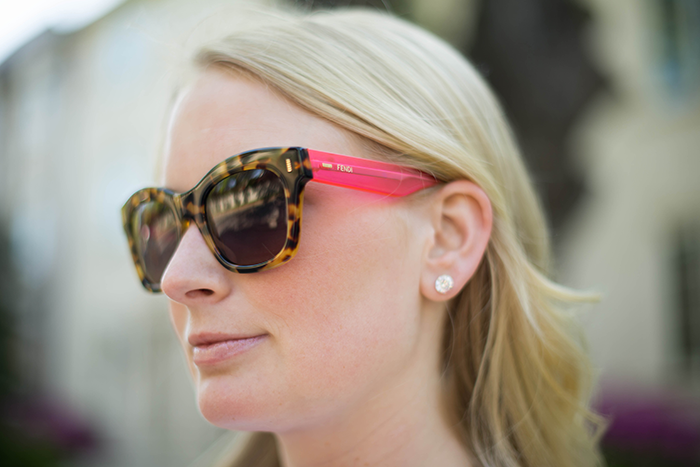 Love your sunglasses as well! That yellow looks so wonderful on you! Enjoy California, just a bit jealous! I came so close to getting this coat the other day! Seeing it on you makes me realize I definitely need to go back and get it! you bought my favorite coat!! perfection. it looks amazing on you – I love it paired with those booties and jeans. Yay!!! The photos turned out so well! Obsessed with your bracelets, by the way. I may have to order a few for myself! I love that coat! Yellow is a great color on you! Have a great weekend! 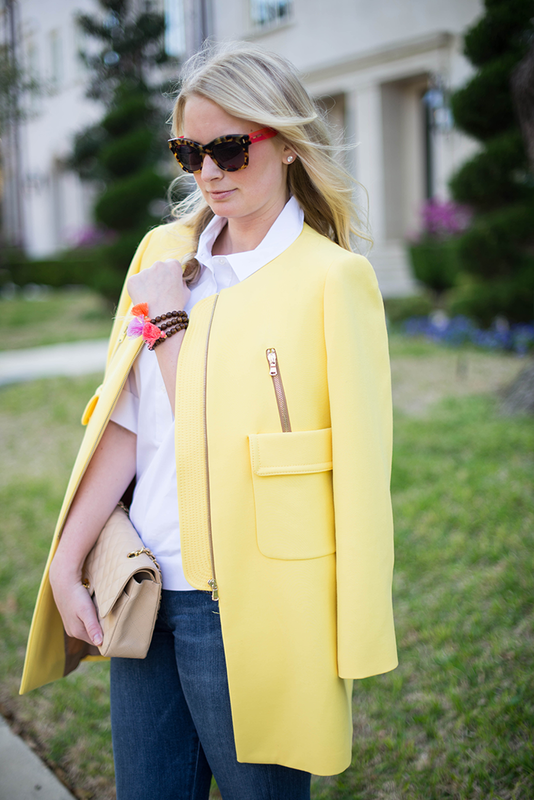 That is a beautiful yellow coat and it looks amazing with the tassel bracelet. Looking beautiful. 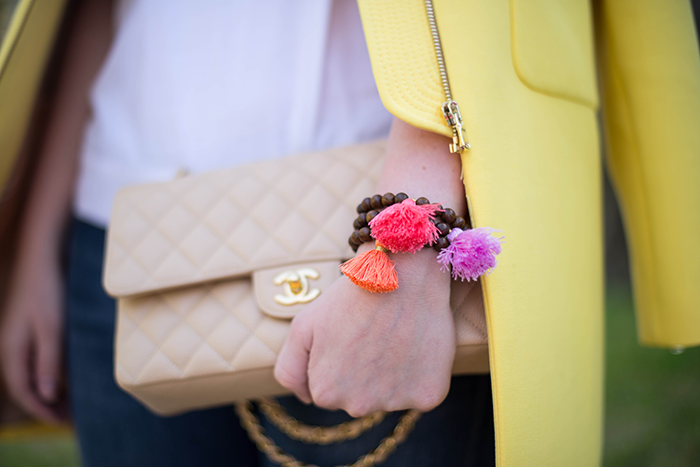 I love those bracelets – so cool & perfect for spring and summer! I love them with the jacket and sunglasses – the outfit is styled perfectly and so chic. I love how your colors are well coordinated! Have fun in La Jolla! It’s a beautiful place! I am OBSESSED with the coat! Have fun at the wedding! This look is so simple but perfect. That yellow coat is just gorgeous! I’ve been eyeing it up in blue and you may have just sold me on it. This may be one of my favorite looks of yours! LOVE the yellow and the neon pink sunnies on the side. Too good! Love this outfit and those bracelets are beautiful! Have a great weekend! 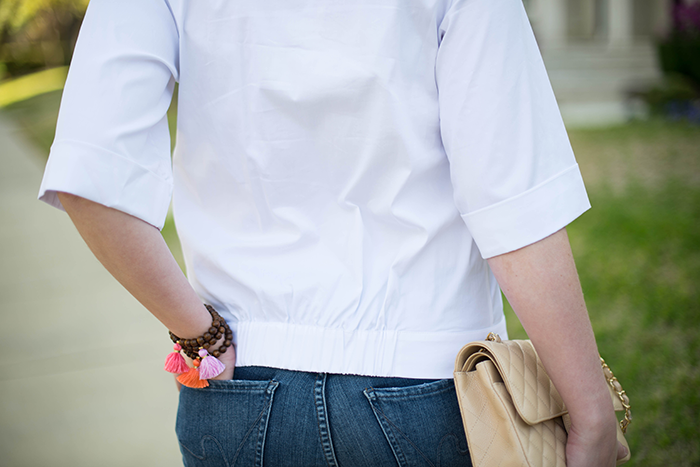 Such a lovely color for that jacket – and I love your tassel bracelet! Need to have those sunnies!!! I love everything about this look! Hope you had a great weekend in La Jolla! Obsessed with your coat!!! Love it!!! It looks so good on you! And those tassel bracelets are so cute too! What size is your bag? Is that the Medium? I have this coat, too, and am completely 100% obsessed with it! !